Wow, two big things to get me out of my sewing rut & into something better and more interesting! 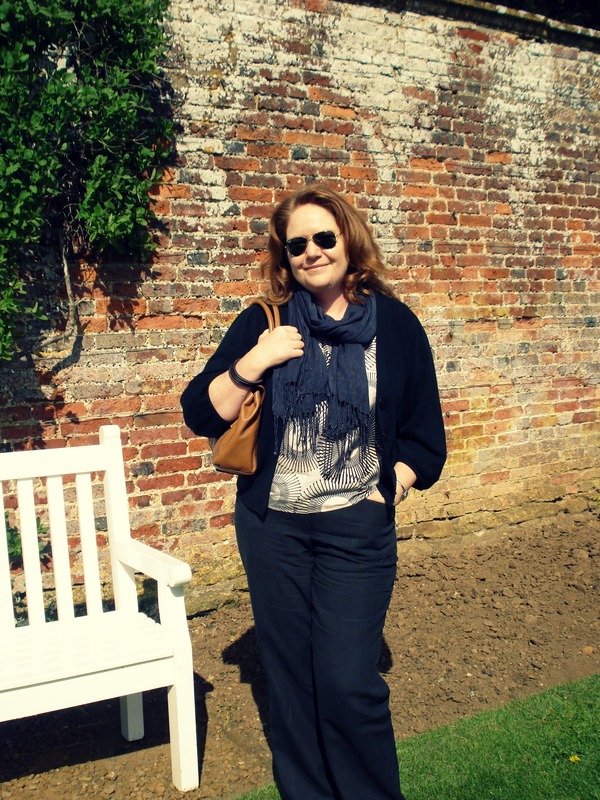 I was in quite a funk earlier in the year & the kind comments of my readers & the discovery of the Wardrobe Architect managed to drag me out of it. I just need time and space to think of all the lovely goodies I’d like to make to suit, and then find the fabric to realise those day-dreams! I made a good start with 3 blouses, then stopped to make fabulous things for skinny daughters & catch up on a bit of vintage sewing. I do plan to make some more Plantains, once I find suitable fabric. My local fabric store has a pitiful selection of jerseys, basically a handful of plains and some Liberty’s. Not what I want! One of the “tasks” for the Wardrobe Architect sessions was to create palettes, neutrals, accents etc, that we liked, then to narrow them down to form one particular palette from which to work. My wordrobe consists mainly of neutrals – that’s where I’m happy, but I do realise the need for a little splash of colour here and there, and with summer knocking faintly on the front door I want to inject some colour or lightness that takes up some of the black & grey I live in in the winter. That has been hard to do. Whilst I like lots of colours, I don’t necessarily want to be wearing them. I also find prints tricky. Again, I like them, I can admire them, but wearing them…. I get scared. My favourite pattern or print is the spot. They’re safe. But I want to be more adventurous!! 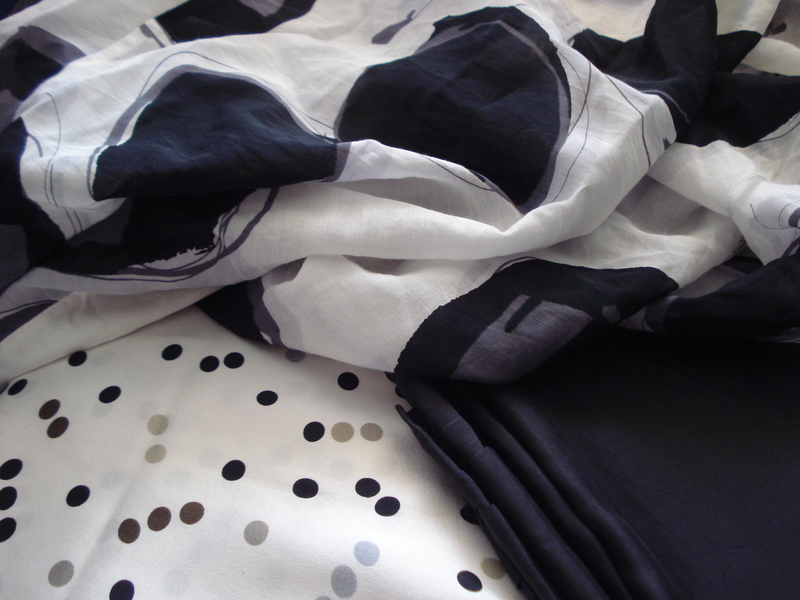 When I look into my fabric pile – meaning the pile I want for myself, I see spots, circles and more spots! And variations on spots & circles… I think I have an obsession. One thing I have managed is to get more pants! Or trousers, if you prefer. There were a couple of pairs of linen trousers from the summer box that still fit – and that I still like the shape of (or can re-cut a bit). But their colours were all wrong. I didn’t take photos, not that long-sighted! One pair was a chocolate brown, like milk chocolate. I have always found them tricky to wear, even though I wanted a pair, I stick with turquoise or white on top. The other was an interesting shade… It was a shot linen, a kind of teal-green and violet. Sounds weird, but I liked the effect. Again, there was a problem of what to wear that with! This time I decided to take action, if I was to wear them, they had to change colour. So I threw them into the washing machine with a box of Dylon Antique Grey dye and waited for the result. I love the new colours! Because I didn’t use a dye stripper first they have come out of the machine with their own take on the grey. The chocolate is now a warm, rich grey that I LOVE, the shot linen has hints of it’s original shade, but overall looks a blue/purple black/grey. They’re perfect! I will re-cut the legs of the purple/grey to make them narrower, but the chocolate grey is a perfect match for some of the colours I came up with for the colour project. While I was dirtying up the washing machine, I also dyed a lightweight beige linen black, & re-blacked a pair black linen trousers that will also be re-cut. All in all a great result! Now to sort the tops….. I have 3 pieces of spotty silk, different weights, weaves & colours and one black & white “blob” silk-cotton blend I made a blouse from a couple of years ago that needs attention. I managed to catch the back on a door-handle or something & ripped it. So I need to come up with something that can re-use parts of it, it’s far too gorgeous to chuck out. This is my current collection of fabrics to work with – help? If you want to see where my whirling head is going with the Wardrobe Architect exercise, I have far too many ideas on my Pinterest board. While I love a floaty, not too structured blouse, I don’t want to make them all look the same. I seem to be taking the same shape at the moment, and just adding different sleeve & collar details. Will they be different enough? At the moment, my hope that me Made May would be giving me the opportunity to really see if my new wardrobe was working properly is off to a stuttering start. I know there’s still a week left, but pattern making takes time! If only I could just decide what to make – with the foresight that it will look fabulous, I wouldn’t be stalling so much. I need input from you fabulous sewists. The sketch above on the left shows what I was thinking of doing with the “blobby” blouse that got ripped. I had the idea from seeing this great blouse on Kollabora. I’m just not that willowy, so I need to be careful of where the contrast goes, and how much to use. Ideas?? My apologies for what seems to me to be a rather rambling post, I just need to get my head round what I should be sewing – and fast!! lol! I just don’t want too much black, I will have to see how it goes, first I need to take it apart, unpicking French Seams is not my idea of fun! 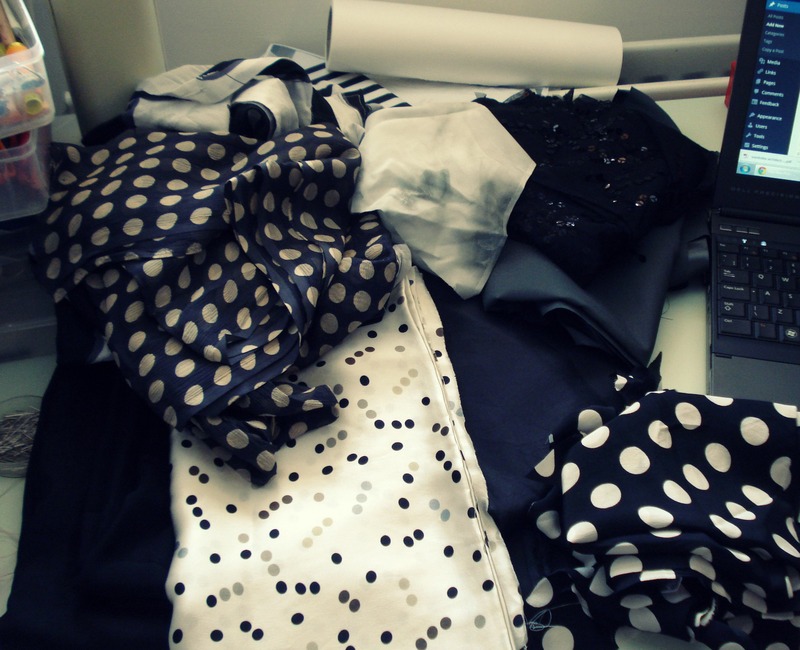 That is a mighty fine obsession to have…those spotty fabrics are To.Die.For! I love the new colour of the trousers. Totally gorgeous and totally you. I have some linen I need to do the same to. It’s been in the stash for far to long and in a different colour would make a lovely maxi dress for warmer days (should they ever arrive). I love dye too. It’s also a great way of perking up items that have become a bit faded. I still haven’t decided which to cut first, although I have made 3 patterns this week, maybe one will be suitable! Your newly dyed pants look great and fresh. We all have different phobias, I guess; mine is fabric dyeing, of which I’m scared to death; but I have no fear of prints :). Your polka dot fabric is gorgeous! I think I’ve worn those pants more in the last two weeks than in the last summer! I really did need to change the colour. Did not finish the comment before hitting post….. Thanks for that, great idea! Your trousers are so awesome! I love the colour (and that fit is PERFECT!) and your top goes so well with it. I have the complete opposite problem to you – I have millions of things with prints and very very few solid colour clothes – maybe we should swap wardrobes?! I find that wearing a solid bright colour with a highly patterned print calms the whole outfit down (although I do look a bit like a children’s TV presenter a lot!) – maybe try sneaking a few patterned print tops in to go with the trousers you made (I am so jealous! I really need to make trousers!)? Or make bright solid colour belts to wear if you want a splash of colour? Have you looked at Wiksten’s Tova top? It’s more like the drawing to the right than the left though. And maybe Grainline’s Archer with 3/4 length sleeves, Colette’s Laurel, or Deer & Doe’s Airelle for the one on the left? I use belts, scarves (on my head to control my crazy hair! ), and bright coloured jewellery to change the look of my (very little) pattern collection, so I’m a little concerned about Me Made May too! lol, I got a few comments a while ago suggesting I try colour blocking on a jacket – I had planned to use a print for the pattern I’d made. The thing is, that with all the plain colours I wear, I colour block almost by accident! I like a bit of a print, but nothing too loud or too busy, I feel like it’s wearing me, rather than the other way around. I have seen the Tova, I like the shape & lines, and the archer is cool, nothing better than a well fitted tailored shirt. I have my own version of the Airelle…… I will eventually come round to something, that’s why sewing and blogging is so cool, you get exposure to loads of new ideas! I’m loving the spots and stripes blouse sketch. Thanks, the spot fabric is from the shirt I ripped, so while I like the look of that sketch, I need to be sure I unpick carefully to keep as much of the fabric as I can! I will help you. As we seem to have the EXACT same tastes in fabrics, colours, and prints, you may send me your delicious stash and I will give it a good home! LOL! haha!! no way, Jose! 😀 I luurve my stash – must get more…..
Don’t be too hard on yourself! I also definitely ” eat too much of what’s not good for me & I don’t exercise.” But we’re going to have fun with Me Made May anyhow! Looking forward to what you come up with for those beautiful fabrics!! Next Next post: It’s Atomic!